The Wireless Mail Alert lets you know when mail is delivered eliminating repeat trips out to an empty mailbox. The mailbox sensor is triggered when the mailbox door is opened. The sensor sends a wireless radio signal to the indoor receiver display, operates up to 1000' (line of sight), which will sound a tone/tune or programmable voice message letting you know the mail has arrived. The Wireless Mail Alert lets you know when mail is delivered eliminating repeat trips out to an empty mailbox. The mailbox sensor is triggered when the mailbox door is opened. The sensor sends a wireless radio signal to the indoor receiver display, operates up to 1000' (line of sight), which will sound a tone/tune or programmable voice message letting you know the mail has arrived. 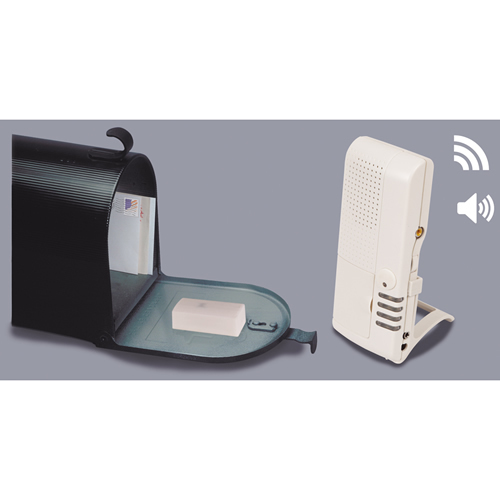 If the supervised transmitter is removed from the mailbox, stolen, loses signal or battery is low, the receiver will produce a single beep once a minute. Sensor uses one 3 volt lithium battery (included), with an average life of 5 years in normal use.